There are many names for groupings of animals. A “herd” is usually a group of mammals with some sort of hierarchy and intra-group communication system. A “flock” is a similar type of association made up of birds (although “flocks of sheep” are the common descriptor possibly because of old language rules). There are also “schools” of fish and “prides” of lions and “packs” of wolves or dogs. A number of specific types of herds and flocks have very peculiar, historically derived names: there are knots of toads, parliaments of owls, basks of crocodiles, murders of crows and many more! We recognize, then, that many animals live in groups, and we can pretty easily recognize the benefits to those animals of their grouping behaviors. A herd or a flock can cooperatively find more food than a single animal is able to locate. In cold environments a group sleeping very closely together helps to keep the individuals warm and contributes significantly to each individual’s overall energy efficiency. Individuals in a group may also share information about the group’s immediate environment or about previous occurrences or methods of solving problems of food acquisition or individual survival. In some species a “culture” can actually develop where unique behaviors are passed along from one generation to the next. A number of bird species (like American oystercatchers and crows, for example) have specific flocks with very specific hunting and foraging patterns. In some of these groups even threat recognition memories are passed along from one generation to the next (see Signs of Summer 7, July 14, 2016). Most obviously, a group achieves a significant degree of protection from predators. This protection can come about relatively passively by a tendency to keep the youngest and thus most vulnerable and most frequently preyed upon members of the herd in the middle of the group, or more purposefully and even cooperatively, by the stronger individuals of the herd aggressively placing themselves between their vulnerable young and a potential predator. 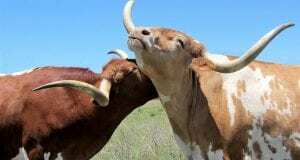 Protection can also be achieved via a variety of “selfish herd” behaviors or through the intimidating effects on a predator confronting a large, moving mass of animals in which individuals are very hard to discern or single out. 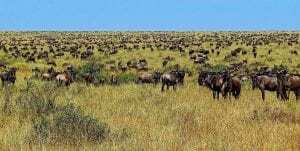 A study on lion prides and wildebeest herds in the Serengeti published in Nature in 2007 (Volume 449, October 25, 2007) showed another benefit of both prey and predator group formation: the establishment of long-term ecosystem stability. 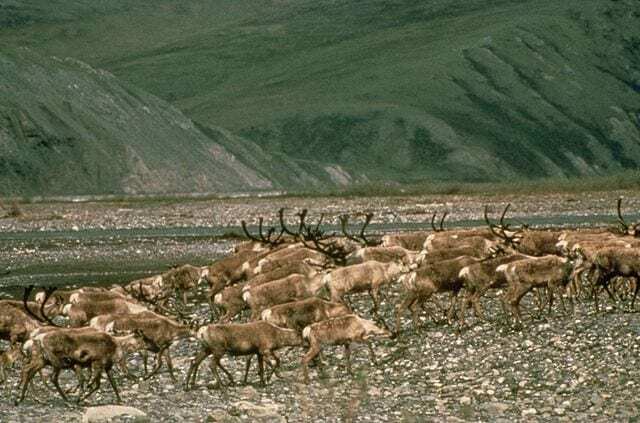 Large prey herds had losses to predators that were 90% less than losses from smaller groupings of prey individuals. Predator groups (the lion prides) took in less prey energy, but did not over-exploit the prey populations. They achieved, then, via increased intraspecific competition and reduced rates of reproduction, a sustainable relationship with their prey. There are also some negatives associated with living in a group like increased competition for food (although as we see with the lions that increased competition may have unexpected benefits to the ecosystem of the grouping species). There is also increased competition for mates and increased difficulties finding unoccupied, optimal sleeping/resting sites. There is also increased exposure to and likelihood of transfer of any number of diseases and parasites. A large herd of individuals is also much more visible in their environment than small, scattered clusters of individuals. Predators can quite easily locate a large herd of potential prey, but as we see in the lion/wildebeest study finding the herd does not necessarily mean taking more prey. So, groups of animals are easy to observe, and their individual and group benefits (which must, of course, outweigh the potential detriments) are easy to infer. Logically, these grouping behaviors are the products of evolution. In a natural selection system individuals that had a genetic predisposition to form a group would have higher rates of survival, more metabolic energy and greater numbers of offspring. 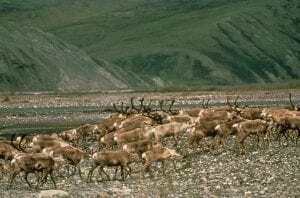 Over time, those genes that stimulated group formation would predominate in the population and a herding or flocking or schooling species would be formed. The more subtle question here, though, is what exactly are those genetic features that would cause some starter species to form a group in the first place? Pituitary gland and hypothalamus. Image by Open Stax. Hormones seem to be a significant part of the answer here. In particular two neuropeptides that are synthesized in the hypothalamus of the brain and then transported via specialized nerve fibers to the posterior pituitary gland or released into the brain itself. Those peptides that go to the posterior pituitary subsequently enter the blood stream where they go out to influence target organs in the body. The peptides that stay in the brain influence a number of specific gray matter regions that play a significant roles in the tendency of an individual to form social bonds and carry out the kinds of cooperative behaviors that can make a group successful. The two neuropeptides are vasopressin (also called “antidiuretic hormone”) and oxytocin. Vasopressin has very straightforward hormonal effects on the body: it stimulates water re- absorption in the kidneys (thus fighting dehydration) and causes arterioles to constrict (thus raising blood pressure). In the brain, though, its impacts are more subtle. It influences social behavior centers especially ones that stimulate an individual to participate in mutually beneficial behaviors (see February 23, 2016 Proceedings of the National Academy of Sciences). It may also help to modulate the body’s stress response and the subsequent synthesis of stress hormones like cortisol and adrenaline. So, in a natural selection cycle, a population of a potentially group forming species would have some individuals with very developed “social brain” receptors for vasopressin and oxytocin. Those individuals would experience positive emotions and reduced stress when they were in physical, visual, olfactory and/or auditory contact with other members of their species. They would, then, be stimulated to form a group in order to maximize these positive emotions and would then reap the wide range of potential group benefits. These benefits would then drive the selection matrix and multiply and conserve these genes in the future gene pool! So what happens to an animal that has these group selection neuropeptide features but is kept in isolation from individuals of its species? The animal becomes stressed, depressed and anxious. It may become so depressed and stressed that it stops eating and may even die. This happens to parakeets (companion parakeets or even a mirror to generate a comforting reflection are requirements for keeping one of these very social birds), it happens in sheep, it happens in cows, it happens in tropical fish, it happens in many zoo animals and it happens in the species that may have derived the most significant ecological and evolutionary benefits from group formation in all of Kingdom Animalia, humans. A human being removed from its group inevitably experiences a wide range of mental health issues revolving around their unregulated and untended social brain chemistry. Sebastian Junger talks about this in his marvelous book Tribe: On Homecoming and Belonging. Junger talks of the “tribes” we form in our lives and the consequences of their dissolution. Family groups, sports teams, military units and groups thrown together under conditions of stress and pain are all explored in the context of the human ability (that single most significant ability, according to Yuval Harari in his books Sapiens and Homo Deus, that has led humans to come to dominate the Earth!) to form groups. Depression, stress and other mental maladies are the consequences of our not paying attention to the evolutionary pathways that have created us.